This is a flashback to four years ago. Yeah, hashtag it with Twirl-back Tuesday or something clever. I missed Music Monday but I can’t let this wait another week. It’s too important. Honestly, I was a bit slow working up to a Christmas spirit this year. I was beginning to think after this election, the best holiday spirit I could come up with would be vodka. But it’s important to keep our center and not be blown off our course by winds we knew could be coming our way. More on that later. For now, I need a little Chrismas. This is one of the songs that even when I just have been working too much or shopping too much, or the year has flown by too quickly, no matter what is going on this song gets me in the spirit. 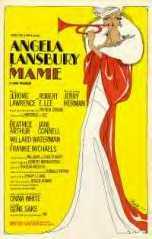 But it has to be Angela Lansbury’s version in the musical Mame. Nobody else has the passion, and personality in it. There is something about the urgency in her voice. Oh, it just gives me goosebumps and makes me smile. The footage from the musical doesn’t seem to be online anywhere, so to remind you, this was set in the roaring twenties before we had commercialized Christmas so much that the department stores were already being preparing for it at Halloween. I believe that it’s just after Thanksgiving in the story line, and so not even a “single flurry” yet in New York. And nobody was thinking about rolling out the holly or the tinsel just yet. And maybe, like me, this year you have been slow to feel the warmth of the season. Maybe it’s a lonely time or a scary time for you. I understand. But when we flash back to the twenties here via Angela Lansbury’s 1966 voice, think about what we need when it comes to that spirit, what it could really mean, about kindness and giving, not about the buy-them-this-so-they’ll-love-you farce that it’s become. Four years ago, when I played this for my beloved Brian, youngin’ that he is, he replied, “You mean she was somebody before ‘Murder She Wrote?” I’ve schooled him a bit on her since then, you can be sure. A most delightful song…have a wonderful holiday! I never knew AL played Mame. The only one I remember is Carol Channing. I never heard this song before but it was certainly cheerful. And also to you, Susan! This is a great song. Have you seen Mrs. Santa Claus, starring Angela Lansbury? The songs aren’t wonderful, though I like “Avenue A.” It’s not a brilliant movie, but it’s pleasant. And I love Bedknobs and Broomsticks! I think I saw Mrs. Santa Claus a long time ago. But yes, I do love her, and the Bedknobs thing. Brian’s gotta see that. Sweet…)) Yes..I remember watching Bedknobs and Broomsticks with my son when he was a little child..Seasonal greetings to you and Brian.. Thank you, sir! To you and your Mark as well. You might also use The Court Jester, where Lansbury plays a princess who threatens suicide in nearly every scene. Danny Kaye and Glynis Johns are fun in it, too, and Basil Rathbone (of Sherlock Holmes fame) plays the bad guy. I’ll have to check that one out! Sounds like a great cast. Very cute! I love the idea of life before Bedknobs and Broomsticks! k.
….slow to feel the warmth….. that’s an understatement! I loved her rendition of Beauty and the Beast, especially when I learned about the story behind the writing of the song. Oh, do tell. I don’t know the story! Briefly, Howard Ashman wrote the lyrics in his last days. He had lived with HIV for a long time, but was very sick when he collaborated with Allen Menken on the songs for Beauty. Ah, thank you. I didn’t know.